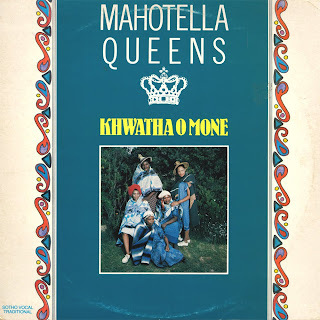 We present to EJ readers today some clean 1980s mbaqanga courtesy of the Mahotella Queens. 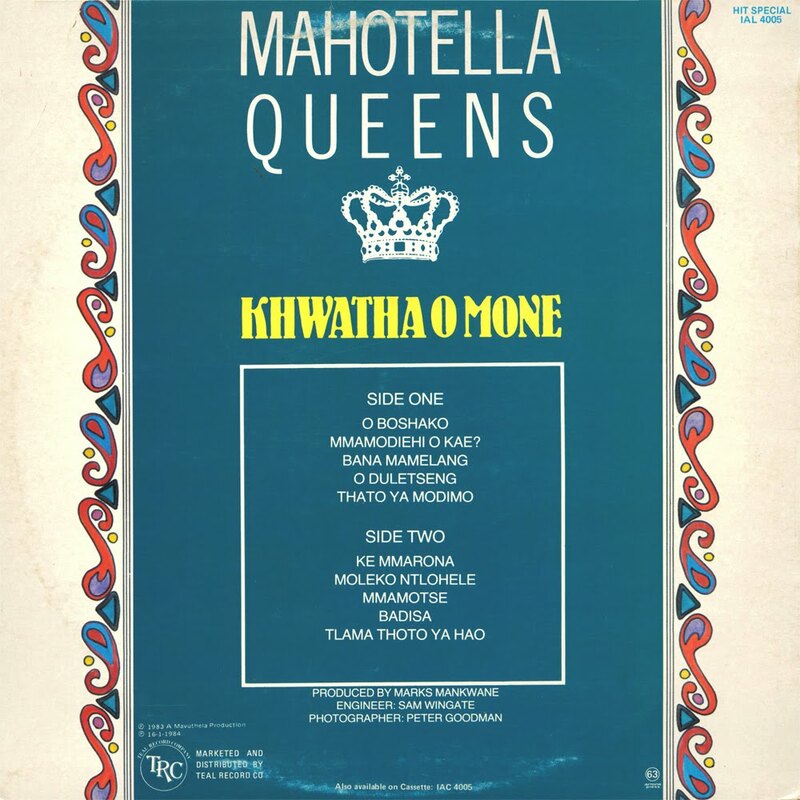 A tasty mix of sounds cooked that great big pot, 1984’s Khwatha O Mone fuses straight-cut mbaqanga with rootsy stuff (“O Boshako”) and gospel (“Thato Ya Modimo”, “Moleko Ntlohele”) but also offers the winning formula of up-front stomping jive (“Ke Mmarona”, “Bana Mamelang”). The cover description calls it “Sotho Vocal / Traditional”, which doesn’t say much at all about how good this material is… American-style soul this definitely isn’t. “O Boshako” is perhaps one of the finest tunes on this LP. Strong lead vocals from Emily Zwane, striking accordion work from Mzwandile David, amazing drumming from Michael Stoffel and layered lyrics written by Caroline Kapentar all help to make this song a great one. Every song is a gem, and this one gets the album off to a great start. Marks Mankwane, producer of the Queens at the time, once again provides crystal clear guitar work in combination with the typical florid keyboards and intricate bass lines. The vocalists on this album are: Emily Zwane (lead), Maggie Khumalo (alto), Beatrice Ngcobo (alto), Hazel Zwane (tenor) and Caroline Kapentar (tenor). 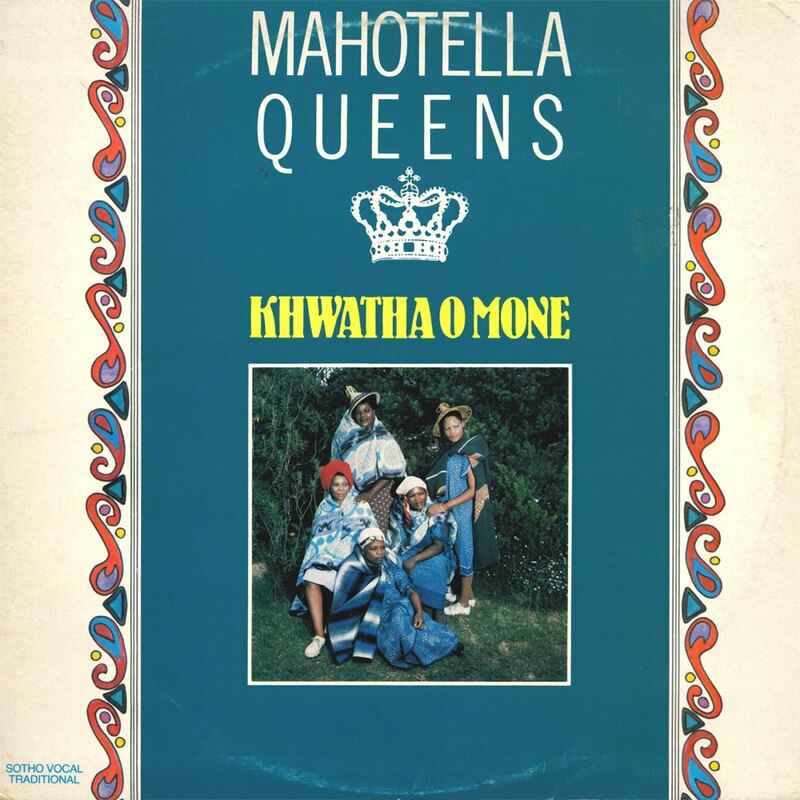 I love the Mahotella Queens. Can't wait to hear this. Thank you! Wonderful! This is about the only place where you can get to hear these old Mahotella recordings. Bless! I nominate Nick as U.K.Cultural Ambassador to S.A.! Hernan: unfortunately, we are unable to share the "Mbaqanga" album - it is still in print, and Electric Jive focuses only on deleted/out-of-print recordings. This is interesting. 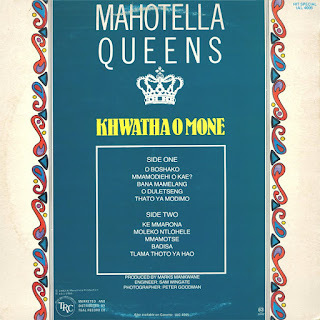 I'm not aware of any other Mahotella Queens albums in Sotho. Did they make any others? Yes, the Queens have recorded prolifically in both Zulu and Sotho languages. Interestingly, the early 1980s seems to be dominated by Sotho and Pedi language material (of which this LP is but one example), with only a few Zulu singles and albums made during this time! Unfortunately, track 2, "Mmamodiehi O Kae?" didn't come with the download, but, not to worry, was able to capture it via YouTube. My one remaining challenge is to find out who wrote it? Thanks for your comment and note on track 2 - very weird indeed, not sure why it's not there - I'll re-upload the LP in due course. "Mmamodiehi O Kae?" was written by Caroline Kapentar who sang tenor for the Queens during the 1970s and 1980s. The song is a throwback to one of Caroline's older compositions, "Mmamodiehi", a hit 1969 single by Izintombi Zomoya.